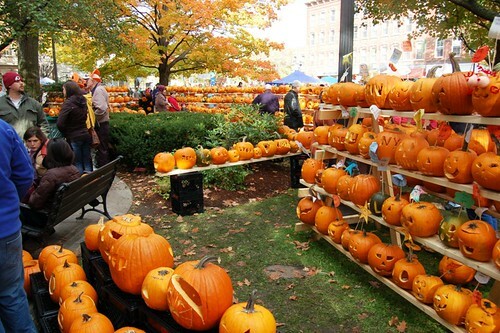 Every year for the past 7 years I have put the Keene Pumpkin Festival in New Hampshire on my list of “Fall Things To Do” – but every year I missed it. Pathetic. This year (the 20th anniversary of the KPF) I knew I needed to man up, so I marked the day on the calendar well in advance. My little sister Melanie is in her second year at Keene State, and the opportunity to visit her while also checking out the festival was too good to pass up. Especially when I learned she needed help re-stocking her candy jar. I have fond memories of my own candy jar in college. Actually, it was a candy drawer. Because I don’t have a car, I took the bus from Boston to Concord Saturday morning, and was picked up by my Dad, Vicki, and Lindsay. We stopped in for a visit with Nana in Hopkinton, and then it was off to Keene! 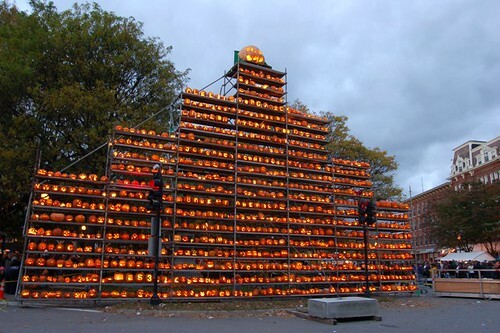 and the downtown area was chock full of thousands of carved pumpkins. and some were sweet (aw, she said yes!). Pumpkin hats and crazy costumes were also plentiful. Yes, I went in the kitchen store and it was heaven. 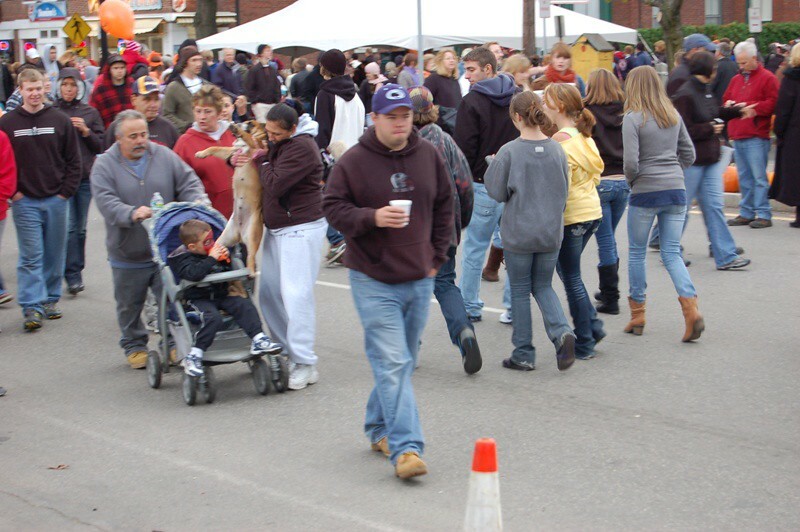 I also saw the amazing sight of a woman hoisting a dog into a stroller. 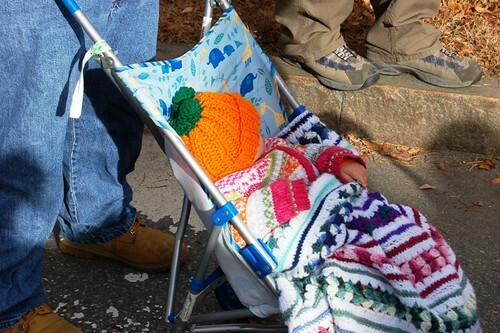 A stroller that already contained a child. 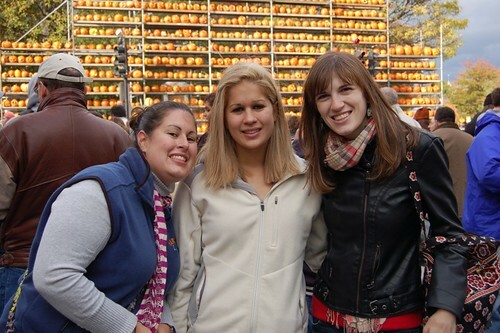 Finally Linds, Melanie and I reached the giant tower of pumpkins! 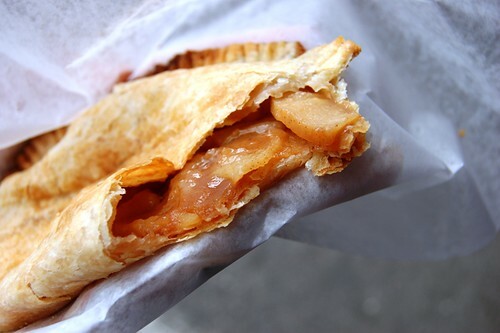 And nearby I found some hot, homemade apple turnovers courtesy of the Animaterra Women’s Chorus…a perfect treat for a chilly day. 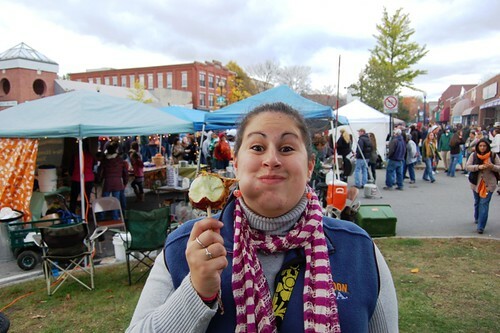 Lindsay was on a mission to find a caramel apple…and was very excited to find one. This picture of her cracks me up. What a goofball! 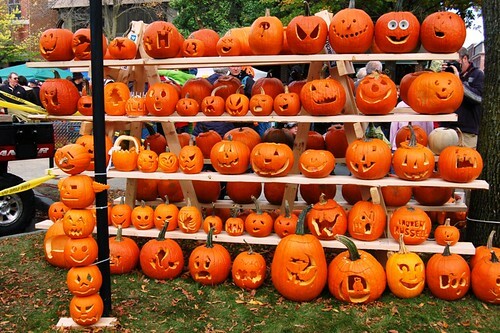 At last it was time to light the pumpkins. 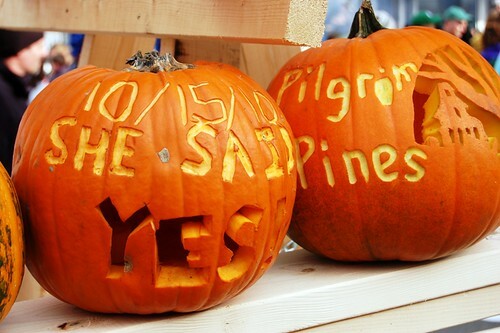 Can you spot the proposal? 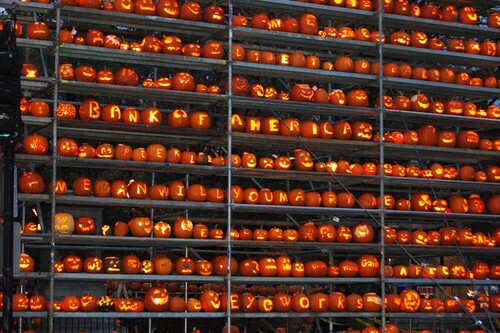 In the end there were nearly 23 thousand lit pumpkins! 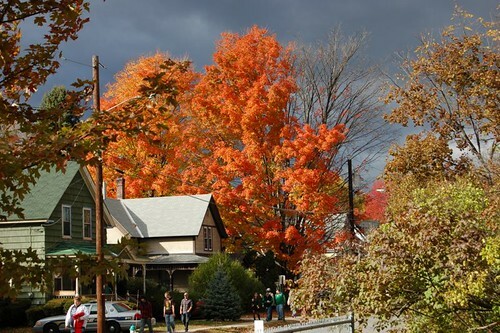 I had a great day with my family in the most beautiful part of the country during the most beautiful season. I cannot believe sometimes that Melanie is in college, since I look at her and see the toddler that couldn’t say my name right…but I am so proud of her! 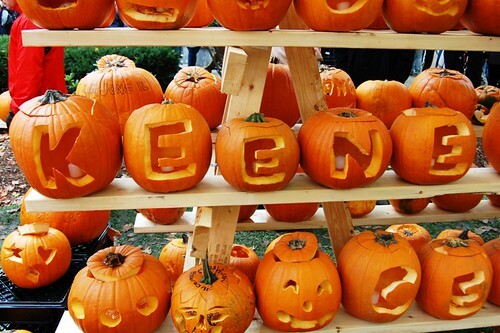 Have you carved your Halloween pumpkin yet this year? I waited until the last second last year and had a very sad dud of a pumpkin, so I am thinking I will try to get to mine this weekend. One hand scooping out the pumpkin guts, one hand in the bowl of candy corn. Sounds like a plan! 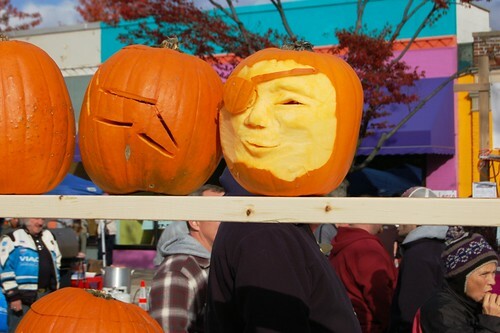 Do you do anything with your pumpkins post-Halloween? We usually roast the seeds but that’s about it. 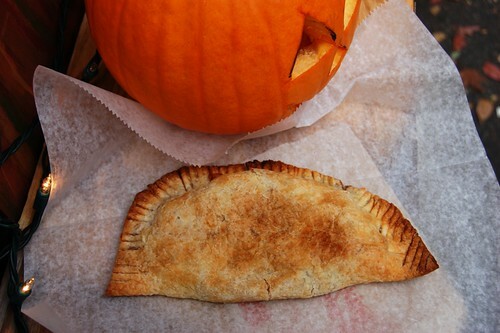 I don’t actually have any pumpkin recipes on hand. 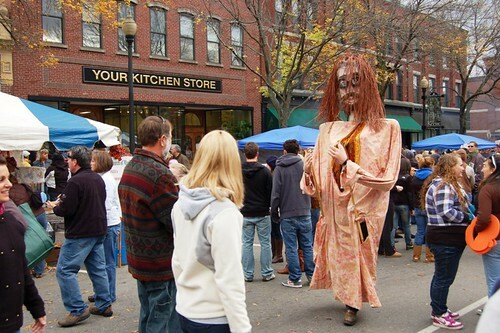 The Keene Pumpkin Festival sounds fun! I haven’t heard of it till now. Great pics!